Are you looking for a hostel in Santurce? We used to be listed as 'San Jorge Hotel & Hostel' or The Hostal @ Hotel San Jorge. All rooms at Hotel San Jorge now have private, ensuite bathrooms. We no longer offer accommodations with shared rooms or shared bathrooms. 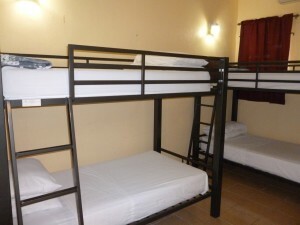 We have private rooms at Hostel Rates! give you a private hotel room with private ensuite bathroom at the SAME PRICE AS A HOSTEL! Just call the hotel direct at 787-727-1223 and ask if the HOSTEL TRAVELER RATE is available for your dates. Rates are for single or double occupancy. Add $10 per person per night for triple or quad rates. For larger groups - ask for special rates for up to 60 guests. Rates are subject to availability - make sure to ask for Hostel Traveler Rate. Rate is not available for weekends in Jan/Feb or any dates in March. Stay in a PRIVATE ROOM for the same price as a hostel! San Juan International Hostel: The is the first hostel in Puerto Rico, in a typical residential neighborhood in Santurce. Located near the Fine Arts Center - between Pavia Hospital and Doctor's Hospital they have limited shared accommodations at a great price. Not fancy, but a hostel that emphasizes friends and community. Hostel H1 Miramar formally The Palace Hostel: Located in the Miramar neighborhood between Ponce de Leon and Fernandez Juncos Avenues. Casa Santurce: Located near the lagoon in the area known as 'Stop 15' with Marshall's as the nearby landmark. The neighborhood is in transition and. people will refer to it as Miramar, La 15 (La Quince) or Alto de Cabra. Nomada Urban Beach Hostel: In the Santa Teresita neighborhood just off Calle Loiza, between Ocean Park and Punta las Marias. Mango Mansion: On the edge of Condado and a few blocks to Plaza del Mercado - 'La Placita de Santurce'. Conturce Hostel: Boutique Hostel on trendy Calle Loiza just across from the Doubletree by Hilton hotel. Santurcia Hostel: Boutique Hostel in the Arts District next door to the Puerto Rico Museum of Art and Centro de Bellas Artes. Villa Eshta: Just outside the gates of Ocean Park between the beach and Calle Loiza hipster action. No matter where you stay, have a great time in the Santurce Arts District or San Juan, Puerto Rico!